Prints at speeds of up to 85 or 105 ppm respectively with 600 x 600 dpi resolution. Looking to replace older IBM InfoPrinters? Because we’re IBM InfoPrint experts, your upgrade and replacement process is guaranteed to go smoothly. Call us at 1-866-430-6202. To enhance productivity and enable operating efficiency, companies need flexible, integrated output solutions. These solutions must offer fast print speeds, exceptional quality, a wide range of capabilities and easy system integration – all at an attractive total cost of ownership. The IBM Infoprint 2085 and Infoprint 2105 are full-function, high-speed printing systems that operate at speeds of up to 85 and 105 pages per minute (ppm) respectively and that provide 600 x 600 dots-per-inch (dpi) resolution to produce high-quality images and graphics. Among the first to effectively combine a true data-centre-centric controller with copying capabilities, both the Infoprint 2085 and Infoprint 2105 are easy-to-use solutions that can help you gain a competitive edge. The Infoprint 2085 laser printers meet the need for fast output speed, moderate duty cycles and flexible capabilities while helping you achieve low operating costs. Designed to meet IBM iSeries* and IBM zSeries* customer requirements, while remaining compatible with other systems, the Infoprint 2085 and Infoprint 2105 are high-function production printers that facilitate consolidation between information technology and reprographics production centres. They are also ideal for distributed environments where they can serve as consolidated printing and copying solutions. The Infoprint 2085 and Infoprint 2105 are the only printers in their class and price range that have the IBM Intelligent Printer Data Stream* (IPDS*) as a standard feature. IPDS is a printer-device datastream that controls printer functions and enables two-way communication between the printer and the printer driver. IPDS printing provides for a co-operative print management system that can help improve error recovery, speed and reliability. The Infoprint 2085 and Infoprint 2105 also support Portable Document Format (PDF), Adobe PostScript and Printer Control Language (PCL). Xerox datastreams are supported by various optional transforms and automatic switching between datastreams. 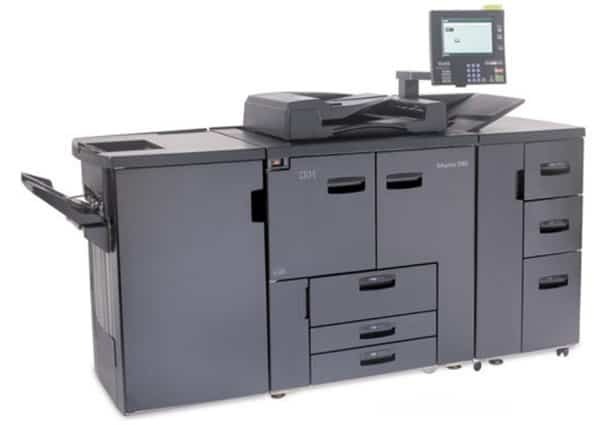 To provide enhanced capabilities, the IBM Infoprint 2085 and Infoprint 2105 are equipped with an integrated scanner that supports digital scanning at up to 72 impressions per minute (ipm). Powerful, yet easy to use, all functions of the integrated scanner can be accessed through a large, intuitive touch panel. By consolidating your production printing and copying needs into a single device, you can achieve optimum efficiency. Designed as full-function, cost-effective multifunction solutions, the Infoprint 2085 and Infoprint 2105 can help increase productivity while reducing the total cost of printing. The combination of a base maintenance plan option with a cost-effective monthly fee and click charges that include toner presents attractive overall operating costs – making the Infoprint 2085 and Infoprint 2105 very affordable products. Both printers can meet your volume and cost requirements by offering up to six input trays that hold up to 7.550-sheets – allowing you to intertwine different coloured stock without paying for manual insertion. Output trays feature high-capacity stitcher/stacker capabilities with up to a 3.000-sheet capacity and a top tray holds up to 500-sheets. Standard finishers support stapling in numerous positions and optional hole-punch kits are available. Printer-resident Web pages – Operators and administrators can view printer-resident Web pages through a browser using the printer Internet Protocol (IP) address. You can use Web-pull printing or direct printing to submit print jobs. e-mail printing and notification – A user can send e-mail with attachments (PostScript, PDF and PCL) to the printer, which can print directly from the e-mail. Web-pull printing and e-mail printing are valuable tools to remote sales users, who can have the printer automatically prepare customer collateral for pickup upon arrival at the office. Send and save – Any user can send jobs to be held for later release, and can use personal identification numbers for added security.